From eternity past, God’s long-range goal has been that people be conformed to the image of Christ (Rom. 8:29). Let’s think of delegation in light of this goal. When we delegate are we doing so in conformity to the image of Christ? And, does the way we delegate help others become more “conformed to the image of his Son”? What will it take to reach this Christ-like goal in delegating? The more Christ-like we become, both inwardly and outwardly, the more Christ-like our delegating becomes. 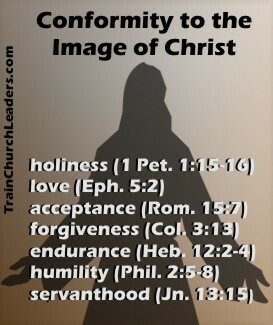 Look at how some of the specific ways Scripture exhorts us to be like Christ relate to leadership skill of delegation. This will give us pure motivations in delegating responsibilities to others. It’s so easy for us to delegate for the wrong reasons. A Christ-like goal in delegating helps us maintain integrity. Previously we looked at what delegation has to do with love. When we delegate because of and with/in agape love, we not only lead purposefully within God’s priorities of loving Him and others but we also showcase Christ, who epitomized what it means to love. One reason we don’t like to delegate is that people might do things differently than we do. We want clones of ourselves to do just what we would do. A Christ-like approach to delegating finds us more open to some of these differences as long as they still align with God and His purposes. As leaders, we must accept the reality that people to whom we delegate responsibilities will make mistakes at times. When we forgive as He does, we help people learn from their mistakes rather than hold it against them. How tempting it can be to bail out of the delegation process at the littlest sign of trouble. Just as Jesus kept an eye on the bigger picture, so must we if we aren’t going to grow weary or lose heart in getting other people involved. Some of the greatest problems in delegating come from our desire to maintain control. We use our position as a leader to rationalize our right to micro-manage when really it’s pride or an inability to let go. We need the same attitude, or mindset, of Christ, who even though He was God, humbled Himself. To use delegation for the greater good of the Body, we must see it as an opportunity for others to do their part as well as to learn and grow. That means, like Jesus who came to serve and not be served, we see delegation as a tool to disciple, or serve, others, not merely as a means to get our work done. Forgiving as Jesus. Peter denies Jesus. Jesus still give Peter responsibility in building his church. Next → Next post: A House of Prayer?